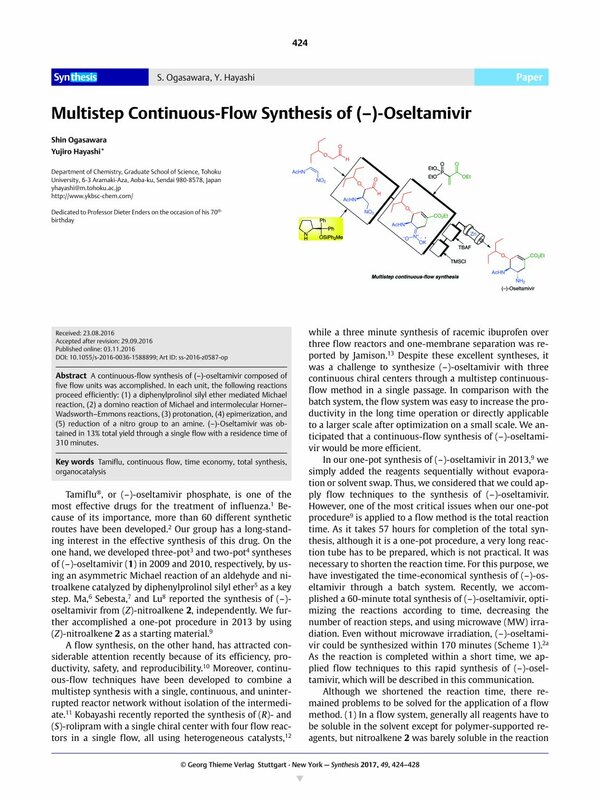 A continuous-flow synthesis of (–)-oseltamivir composed of five flow units was accomplished. In each unit, the following reactions proceed efficiently: (1) a diphenylprolinol silyl ether mediated Michael reaction, (2) a domino reaction of Michael and intermolecular Horner–Wadsworth–Emmons reactions, (3) protonation, (4) epimerization, and (5) reduction of a nitro group to an amine. (–)-Oseltamivir was obtained in 13% total yield through a single flow with a residence time of 310 minutes. Supporting information for this article is available online at http://dx.doi.org/10.1055/s-0036-1588899. 15 A micromixing device, ‘Comet X-01’, is available from Techno Applications Co., Ltd., 34-16-204, Hon, Denenchofu, Oota, Tokyo, 145-0072, Japan (e-mail: yukio-matsubara@nifty.com). 17 The yield was determined by 1H NMR analysis using 1,3,5-trimethoxybenzene as internal standard. 18 ‘SNAP Empty cartridge’ is available from Biotage Japan Co., Ltd., 1-4-14, Kameido, koto-ku, Tokyo, 136-0071, Japan (e-mail: japan-info@biotage.com).